Advantage Book Binding can make specialty packaging for books and other products. These can be matched in color and material to the book or designed to complement the product’s appearance and texture. Similarly, our packaging products can complement other products for a unique, stand-out look. Specialty packaging, slip cases, and clamshell boxes are available for books and mailing materials. Specialty packaging is great for both commercial and personal purposes. The packaging will keep books and paper products safe from outside elements while still presenting a nice aesthetic on the outside. 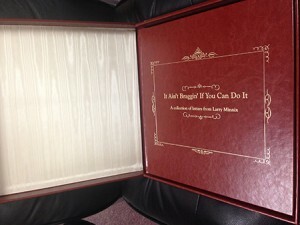 Keeping the specialty packaging can make a book a unique work of art for coffee table works, collector’s edition prints, and other print products. People are genuinely interested in a unique product that very few people can get. Using specialty packaging for only one or two printings of a book can add some extra special flare to your product. It will help push sales and interest your customer base. Even if someone already has a previously printed edition, he or she is likely to want the copy in the specialty packaging as well.